What’s Up with That Foamy Stuff When You Wash Canned Beans? As a vegetarian, I eat beans 鈥� and lots of them. 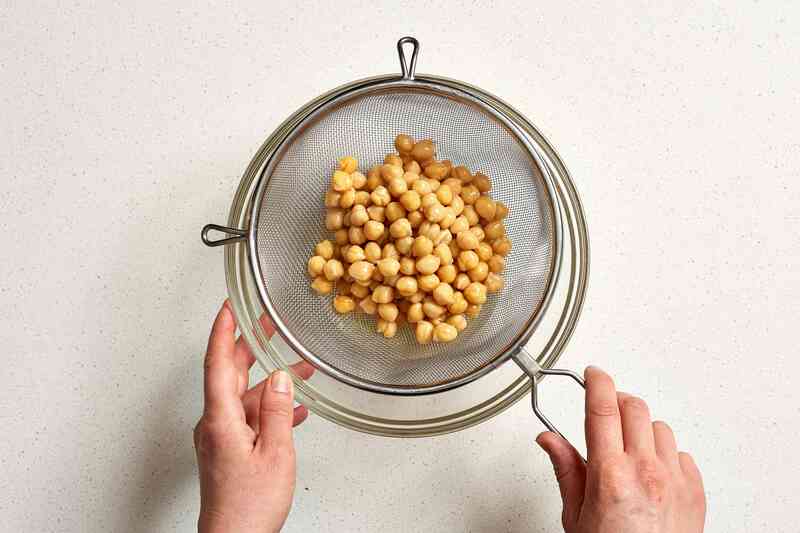 At least once a week, and usually far more often, I鈥檒l find myself at the sink rinsing off canned kidney beans in a colander to rid them of the liquid glop from the can, or standing over a pot of dried chickpeas, giving it an occasional stir. In both instances, foam appears, and I鈥檓 vigilant about eradicating it 鈥� rinsing cooked beans until the water runs clear and skimming off the cloud of foam that appears on top of the pot of dried beans. After years 鈥� decades even 鈥� of these bean-prep habits, it occurs to me that maybe my foam eradication quest is not entirely necessary. To find out, I reached out to nutritionists to find out what causes bean foam 鈥� and if it鈥檚 safe to eat. The source of the foam that forms, whether as you rinse canned beans or cook dried ones, is threefold: starch, protein, and saponins. 鈥淭he foam that appears on dried beans when they are cooked is made up of excess starch and protein that dissolve from the beans when cooked,鈥� says Diana Orenstein, a registered dietitian with Newton-Wellesley Hospital. For canned beans, which are already cooked, those starches and proteins wind up in the canning liquid, says Jackie Newgent, RDN, a culinary nutritionist and author of The All-Natural Diabetes Cookbook. 鈥淭his can also cause foaminess, especially in chickpeas and white beans,鈥� she says. The third factor that leads to foam: saponins. If you鈥檙e wondering what these are, Newgent explains: 鈥淪aponins are a group of naturally occurring plant compounds found in beans and other plant foods, like quinoa and spinach, that can produce foam when they鈥檙e dissolved in water or other liquid.鈥� Saponins are known for causing this soap-like lather (fun fact: 鈥渟apo鈥� comes from the Latin word for 鈥渟oap鈥�). Is the Foam Safe to Eat? You can rinse your beans 鈥� and certainly you鈥檒l want to if you鈥檙e chucking them into a salad, where the can鈥檚 viscous liquid would appear unsightly 鈥� but if you鈥檙e making a stew or soup, you can opt to skip this step. 鈥淚t鈥檚 not necessary to wash canned beans for health purposes unless you buy beans canned with salt and you need to curb your sodium intake,鈥� says Newgent. In that case, rinsing your beans is a pretty effective way to cut the sodium; one study found rinsing reduced sodium by 40 percent. Read more: Should You Be Concerned About Salt in Your Canned Goods? In fact, since the liquid in the can has some proteins and nutrients 鈥� as well as those saponins 鈥� you might want to hold onto it. 鈥淭here鈥檚 some evidence that saponins may play a role in reducing blood cholesterol as well as have anti-obesity and anti-inflammatory potential,鈥� says Newgent. Plus, when it comes to chickpeas, if you rinse the liquid glop down the drain, you鈥檒l miss out on aquafaba, which can be used as 鈥渁 vegan option in place of egg whites, like aquafaba whipped cream!鈥� says Newgent. As with the canned beans, there鈥檚 no health-related reason to discard the foam that appears on the surface of a pot of cooking dried beans. 鈥淭he foam is not harmful, and can be eaten without concern,鈥� says Orenstein. However, she notes, many do skim off the foam for aesthetic reasons. Does the Foam Have a Taste? One reason you may want to skim off the foam as dried beans cook: taste. 鈥淪ome people claim that the foam may have a bitter taste, but most people do not notice this,鈥� says Orenstein. Bottom line: Try cooking up dried beans with and without the skimming process to see if you notice a difference in taste and bean texture. If you do not, consider it one less task in the kitchen.